Hello-Hello Kids is a new iPhone app that gives children a head start in learning different languages in a fun and engaging way. The app focuses on using bright, kid-friendly images to explain concepts and teach new words, and includes animated flashcards and audio examples. The seven languages included in the app are Spanish, English, French, German, Portuguese, Mandarin Chinese, and Dutch. 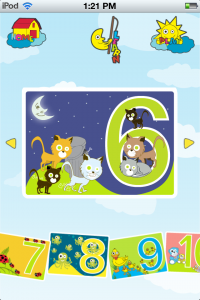 The PLAY section of the app focuses on helping kids to learn and remember numbers. There are also quizzes designed to gauge each child’s progress. It’s well-documented that the best time to learn new languages is during childhood, so if you want to encourage language learning, Hello-Hello Kids should be a good pickup. Hello-Hello Kids is available now in the iTunes App Store for $2.99.